With Tour De France 2016 taking place from Saturday July 2nd to Sunday July 24th. A motorhome holiday could be an ideal way to see the legendary race! According to BBC news Britain’s Tour de France champion Chris Froome. He won the tour in 2013 and 2015, welcomed a “great” 2016 route which should help his bid for a third victory. “It challenges every aspect of cycling – time trials, mountains, a technical descent,” said Froome. By hiring a fully equipped luxury motorhome, you don’t need to worry about finding and booking accommodation near the route. We can plan your route and itinerary for you and will book your Eurotunnel or ferry crossings! Also book campsites near the race route and we’ll even organise your parking. 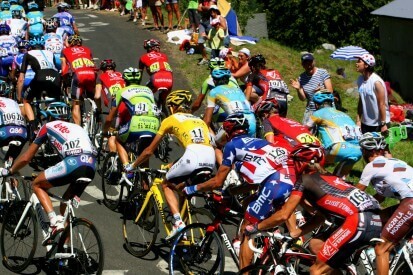 Made up of 21 stages, the 103rd Tour De France will cover a total distance of 3,519 kilometres! And will visit three neighboring countries: Spain, Andorra and Switzerland. The race begins at Normandy’s beautiful Mont Saint-Michel and finishes on the Champs-Elysees in Paris. “The three weeks of racing at the Tour de France are a treasure trove of memories, as outbursts of joy make us forget tears of suffering, mountains leave their mark on the race, a handful of sprints stand out for their fierceness and the podium on the Champs-Élysées brings a mosaic of emotions to a solemn close,” says Christian Prudhomme, Director of the Tour De France. Let the Motorhome Travel Agency plan a bespoke package for you around the excitement of Tour De France 2016 — call 0117 9372644, or email info@motorhometravelagency.com for more information. Connect with us via our Facebook and Twitter pages where we regularly post exclusive news, offers and competitions.